Hugh Richard Louis Grosvenor, 7th Duke of Westminster (born 29 January 1991), styled as Earl Grosvenor until August 2016, is a British aristocrat, billionaire, businessman and landowner. He inherited the title of Duke of Westminster on 9 August 2016, on the death of his father, Gerald Grosvenor. The duke is estimated to be worth £9 billion (US$13 billion), making him the world's richest person under age 30. 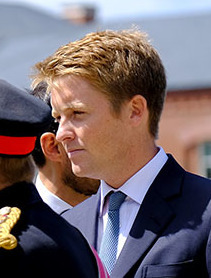 Hugh Richard Louis Grosvenor is the third child and only son of the 6th Duke of Westminster and his wife, Natalia (née Phillips). He was baptised into the Church of England on 23 June 1991. Unusual for the children of hereditary peers, Hugh Grosvenor and his sisters were educated at a local state primary school, followed by a small private day school, Mostyn House School, near the family home of Eaton Hall, Cheshire. He then attended Ellesmere College, Shropshire, a public school, from 2000 to 2009. At Ellesmere, Grosvenor served as a School Prefect, Captain of Meynell House and Captain of the First XI Football Team in his final year. He was awarded Full Colours in Football, and as a member of the School's Combined Cadet Force he obtained a BTEC First Diploma in Public Services with Distinction. From 2011 to 2013 he studied countryside management at Newcastle University, graduating with a Bachelor of Science degree with upper second-class honours. After university, the then Earl Grosvenor worked in estate management at Wheatsheaf Investment from 2013 to 2014, and the Grosvenor Group from 2014 to 2015, before becoming Accounts Manager at Bio-bean, a green energy company, in January 2016. Upon his father's death, in August 2016, as well as the peerages, he inherited a wealth currently estimated at £9 billion, with considerable trust funds for his sisters. This wealth is held in a trust, of which the Duke is a beneficial owner but not the legal owner — an arrangement which received considerable press attention due to the inheritance tax exemption this confers. Little is publicly known about the Duke of Westminster's personal life, as a result of his family's efforts to maintain his privacy. However, in October 2013, he received some attention when he was named a godfather to Prince George of Cambridge. As of 2017, the Duke of Westminster is dating 27-year-old Harriet Tomlinson, whom he met when they were both pupils at Ellesmere College. The dukedom of Westminster was created by Queen Victoria in 1874. ^ a b "Meet the young billionaires as Hugh Grosvenor inherits £9bn". BBC. Retrieved 10 December 2016. ^ Dovkants, Keith. "Hugh Grosvenor: How the richest man in the world under 30 stays normal". Retrieved 31 January 2018. ^ "The 25-year-old Duke of Westminster's £9bn fortune missed his sisters, but there's reason they didn't complain". The Independent. 12 August 2016. Retrieved 31 January 2018. ^ Levin, Angela (1 October 2013). "Lady Edwina Grosvenor: 'I see my wealth as a gift that I should put to good use'". The Daily Telegraph. ^ Bradberry, Grace (23 January 2004). "Who'll inherit London?". London Evening Standard. Retrieved 4 February 2016. ^ a b "The Ellesmerian 2009" (PDF). The Ellesmerian. 2009. Retrieved 9 August 2016. ^ a b "Team – bio-bean". Retrieved 10 August 2016. ^ a b "Hugh Grosvenor | LinkedIn". uk.linkedin.com. Retrieved 10 August 2016. ^ Garside, Juliette (11 August 2016). "Inheritance tax: why the new Duke of Westminster will not pay billions". The Guardian. ISSN 0261-3077. Retrieved 14 May 2017. ^ "How the Duke of Westminster dodged IHT – MoneyWeek". MoneyWeek. 21 August 2016. Retrieved 14 May 2017. ^ "Inheritance tax, and how the Dukes of Westminster avoid it on their £9bn fortune". The Telegraph. Retrieved 14 May 2017. ^ "Duke's £9bn inheritance prompts call for tax overhaul". The Guardian. 11 August 2016. Retrieved 11 August 2016. ^ Duboff, Josh (23 October 2013). "Hugh Grosvenor: Meet the 22-year-old, baby-faced, absurdly rich godparent to Prince George". Vanity Fair. Retrieved 10 August 2016. ^ Rayner, Gordon (23 October 2013). "Prince George christening: profiles of the godparents". The Daily Telegraph. Retrieved 10 August 2016. ^ Reporters, Telegraph (20 March 2017). "Who is the Duke of Westminster's girlfriend, Harriet Tomlinson?". The Telegraph. ISSN 0307-1235. Retrieved 2 March 2018. ^ Hill, Patrick (18 March 2017). "He is one of the most eligible bachelors - and now he is set to break hearts". mirror. Retrieved 2 March 2018.